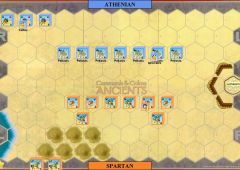 Green circled units (light infantry, light sling infantry, light bow infantry, light cavalry, light bow cavalry, light chariot) may always Evade. War machine units may always evade. 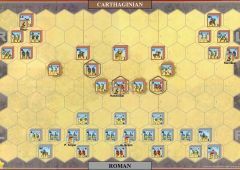 Medium cavalry and camel units may Evade all foot and heavy mounted units. 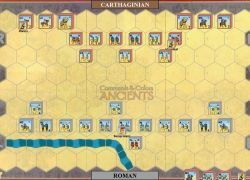 Heavy cavalry and heavy chariot units may Evade all foot and elephant units. 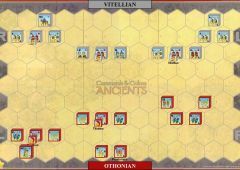 Auxilia, medium infantry, warrior, heavy infantry and elephant units may never Evade. An Evade movement is a 2 hex move towards the unit’s own side of the battlefield. An Evade move of 1 hex is possible and is permitted, but only if it is the only possible hex available. 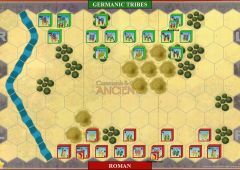 A unit may not Evade if both hexes towards its side of the battlefield are occupied by impassable terrain hexes, units (regardless if friend or foe) or a lone enemy leader. The attacking unit may not occupy the defender’s original hex, regardless of the result of the attacking unit’s die roll on the evading unit. Even if the evading unit is eliminated by the attacking unit’s die roll, the attacking unit may not enter the hex. NOTE: Evasion is not simply “running away.” Evading usually represents a fighting withdrawal that hinders the enemy advance, but at some risk to the unit. If a war machine unit declares it is going to evade and is not eliminated by the Close Combat dice rolled against it when evading, it is removed from the battlefield. The war machine crew has escaped and does not count as a Victory Banner. Leaders Evade somewhat differently from units. 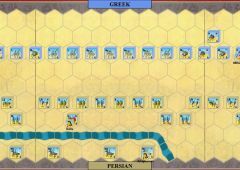 A leader’s Evade movement is 1, 2, or 3 hexes back towards his own side of the battlefield. When a leader is attached to a unit and the unit loses its last block by Ranged Combat or Close Combat, make a leader casualty check on the leader by rolling one die. To score a hit on the leader, you need to roll one leader symbol. If the leader is not eliminated, the leader must evade. If this occurs in Close Combat, the attacking unit may take a Momentum Advance because it eliminated the defending unit. 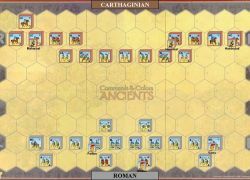 When a leader is alone in a hex (unattached), and is attacked by Ranged Combat or Close Combat, the unit attacking the leader determines the normal number of battle dice to roll. To score a hit and eliminate the leader, you need to roll one leader symbol. If the leader is not eliminated, he must evade. The attacking unit may not make a Momentum Advance after Close Combat against an unattached leader, whether the leader is eliminated or not. A leader’s Evade movement is 1, 2, or 3 hexes back towards his own side of the battlefield. The player who controls the leader determines the number of hexes he will move, and which path he will take as he Evades. 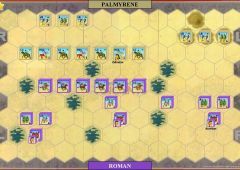 If enemy units occupy one or two hexes of a leader’s designated Evade path, the evading leader must attempt to escape through those hexes. 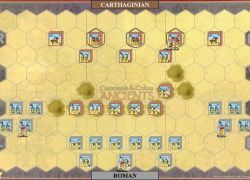 1) An enemy light infantry unit and medium cavalry unit occupy the two hexes behind a lone leader who must evade. The hexes behind these two enemy units are vacant. 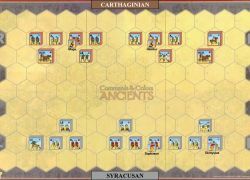 The leader chooses to evade through the hex with the light infantry because the opposing player will roll only two dice instead of the three dice the medium cavalry unit would roll. The opposing player rolls two dice and gets one sword hit and one red square. Since no helmet symbols were rolled, the leader successfully escapes and finishes the Evade move after moving one or two more hexes. 2) The hex behind a lone leader is vacant. 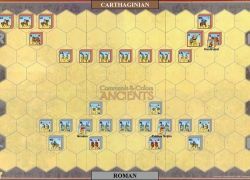 The next hex is occupied by a medium cavalry unit. 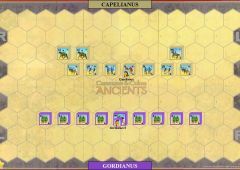 A friendly unit without a leader occupies the hex behind the medium cavalry unit. 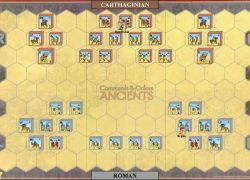 The leader could make a one hex Evade into the vacant hex, but elects to Evade three hexes, ending in the hex with the friendly unit. 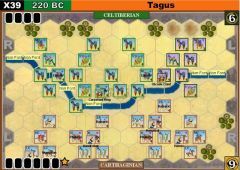 Upon entering the second hex containing the medium cavalry unit, the Evade move is halted, and the opposing player rolls three dice, obtaining two flags and a green circle. Since no helmet symbols were rolled, the leader successfully escapes and continues the Evade move into the third and final hex containing the friendly unit. 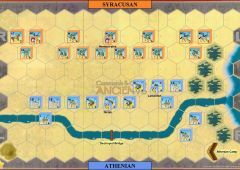 3) The only available Evade path has an enemy light infantry unit in the first hex and an enemy medium cavalry unit in the second hex. The evading leader moves into the first hex and halts while the opposing player rolls two dice for the light infantry unit, obtaining a flag and a sword. The escape succeeds, but the leader now must undergo another escape attempt as the leader is moved into the second hex. 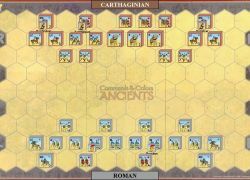 The opposing player rolls three dice for the medium cavalry unit, and obtains a blue triangle hit and two helmets. Only one helmet is needed, and the leader is removed, one hex short of safety. The opposing player earns one banner for the eliminated leader. When an ordered unit attacks in Close Combat and eliminates or forces the defending enemy unit to retreat from the hex it occupies, it has conducted a successful Close Combat. 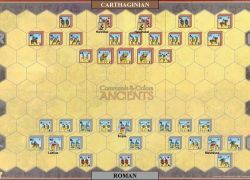 The victorious attacking unit may advance (move) onto that vacated hex. This is referred to as a Momentum Advance, where the unit’s momentum after the successful Close Combat carries it onto the vacated hex. 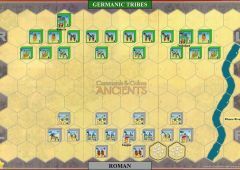 A cavalry unit (light, light bow, medium, heavy or heavy cataphracted cavalry), after its initial successful Close Combat, may Momentum Advance into the vacated hex and then move one additional hex. 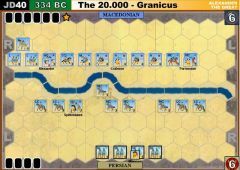 All camels, chariots and elephants, while considered mounted units, are not cavalry and are not eligible for the additional one hex movement. This one hex additional move is optional and is not required to conduct a bonus Close Combat. 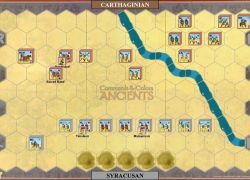 After a successful bonus Close Combat a cavalry unit may only momentum advance onto the vacated hex. 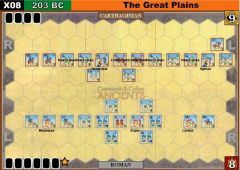 A unit ordered by a ‘First Strike’ card is not eligible to Momentum Advance, but the unit targeted by the First Strike remains eligible for Momentum Advance and possible bonus Close Combat. 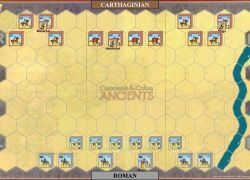 A camel, cavalry, chariot or elephant unit may make a bonus Close Combat after a Momentum Advance. 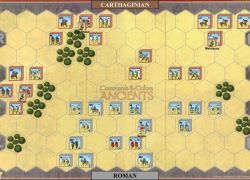 Note, a cavalry unit on its initial successful Close Combat, may Momentum Advance (move onto) the vacated hex and then move one additional hex. 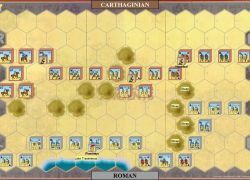 When a unit’s bonus Close Combat is successful it may momentum advance (move) onto the vacated hex but may not battle again this turn. 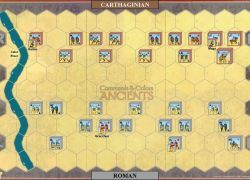 A cavalry unit on a successful bonus Close Combat may only move onto the vacated hex, it may not move the one additional hex. 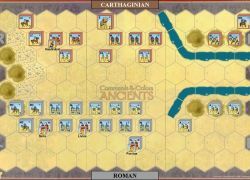 Some Terrain restrictions prevent movement onto the vacated hex.